I have been thinking a lot about fast food and how we consume it. The number of venues for inhaling a quick burger, burrito, sandwich, or serving of French fries amazes me sometimes as I drive around my small town. How many of these places do we need? Subway is the clear winner where I live for most spots to grab a sandwich and I have been thinking hard about why it outnumbers McDonald’s, Wendy’s, Burger King COMBINED. Why do they keep sprouting up like weeds? It is all in the customization. 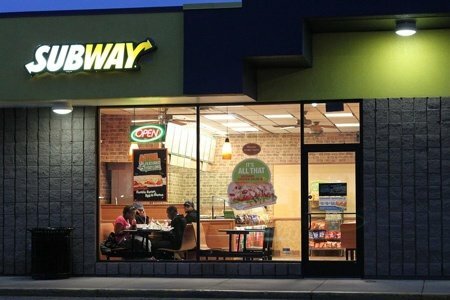 You can get exactly what you want or need from Subway versus the other venues. Yes, I know you can “have it your way” at Burger King but watching the sandwich made in front of you changes things. Do I want whole wheat? Yes! Do you want me to core out the bread? Okay! Do I want cheese? No, thank you. Do I want extra mayo? Heck, no. Do I want as many vegetables as you can fit on my sandwich? Yes, I do. A 6-inch Veggie Delite is a mere 230 calories - 4 Points+ - which is very low for fast food. If you stop by for breakfast, you can get an egg sandwich and add tomatoes, green pepper, spinach, onions, etc. to it. The Egg McMuffin doesn’t wear any vegetables at all. It seems almost naked in comparison. Why, oh why Egg McMuffin do you not wear any vegetables? The downsides of Subway are many. For example, you may show up with the intention of getting the “Veggie Delite” only to be swayed by a massive pulled pork sandwich with Fritos on it. In addition, there are the ubiquitous LARGE sodas, cookies, and bags of chips. When you go to McDonald’s, you can choose a salad but do you? The salads at McD’s comprise only 6% of sales. I think people get there and take one look at a Big Mac with fries and shelve their salad ordering intention. Honestly, McDonald’s gives me a stomach-ache (not kidding) so I have been saved many times by Subway when I am on the road. What do you like about Subway? Do you choose it over McDonald’s? I really like Subway- the veggie delite, the pizzas you can add your own veggie choices to, and the breakfast sandwiches - I love all the veggies. I worked at McDonald's during high school and college- before the nutrition information was available. I gained sixty pounds over four years! There are some things I will not eat now that I know what is in them! I love that you can just point at what you want and so when I travel all over the world and end up in a country where I do not speak the language I am thrilled to find Subway! When I was in Seoul Korea 10 years ago I could not read menus and did not know what anything was and when I saw Subway I almost jumped for joy! I frequently get salads and my favorited 6" sandwich is Grilled Chicken on 9 grain wheat bread with lots of veggies and hot sauce....delicious! I do love Subway. I DO get as many vegetables as possible. They sometimes have trouble closing it! As for McDonald's, their salads are pretty good- just have to watch the salad dressing portions- but that's anywhere you get a salad. When going into fast food places or just eating out in general, I have a mantra- Nothing tastes as good as being thinner feels! That helps me! When I go to subway I have never been asked "Do you want me to core out the bread?" I did not even think of this let alone know it was an option. Thanks!!! Just a word of caution: the sodium is pretty high in restaurant fare, including Subway. A 6" Veggie Delite has 520 mg. When I teach label reading in diabetes education classes, the rule of thumb is to limit sodium to 600 mg per meal, 200 mg per snack, for a total max of 2400 mg daily. Ideally 1500 mg is the limit for those over 50 and folks with diabetes, heart disease, hypertension, etc., but many people find it difficult to achieve this. Hint: it is possible by choosing mostly fresh and minimally processed foods. @Lynn - I will ask the pistachio people why you haven't gotten them. Sorry about that! While I agree that Subway may be better than other fast food establishments because of the reasons you mentioned SG, I am always wary of the many over-processed ingredients in restaurant food--most especially fast food. Ever since Subway's "yoga mat" incident, I haven't eaten there at all. Subway says that they took this ingredient out of their bread, but it makes me wonder about the other ingredients they use, especially in the meat. I figure if I am trying to cut out over-processed food at home, that I should when I eat out as well. For me - mcds has great options and don't rule them out!!!! Snack Girl, any thoughts on subway's new ingredients? I hear they've redone their chicken? I love Subway and I love your new book. Thanks for your work. I look forward to your emails. Never knew about coring the bread! Thanks so much - one of my big compaints with them has been it is just too much bread for all the vegies! All this food talk, geez! I would like it if it were drive up with a glass window for sandwich making. I only have 1/2 an hour lunch. I like Wendys because the small chili is only 4PP. Sometimes I get a plain potato and put my chili on it. This with unsweetened tea are good choices. Subway is about the only fast food place I frequent. My go-to order is their "Double Chicken Chopped Salad". They have either fat-free ranch or Italian dressing in packets behind the counter. So skip the cheese, crutons and use a little of the dressing and you have a pretty healthy meal. Check out Foodbabe.com for the info on Subway and the "yoga mats". Very educational site and she has a book coming out in a couple weeks as well. I agree with you about Subway, and love your blog. I had to laugh, though -- at least on my screen, a McDonald's ad (free coupons!) appears right next to the text of your blog! And at subway, you can ask for double meat and get twice the protein on your sammy for just $1 or $2 more (give or take, i believe.) A great option to fill up on more lean, healthy good stuff without more bread calories. Skip the chips and spend those calories on double protein! I love the bread coring out, too. Thanks for that tip, SG! You can also ask for just the sauce they use on the meatballs and it's so yum-o, if you'd like a warm, tomato-y sauce on your stuff for a nice change. I much prefer Pita Pit to Subway. Far less bread per mouthful and instead of microwaving your chicken or beef, they grill it. They'll grill your veggies too. I haven't eaten at McD's in decades. They're just nasty. I love the Subway chopped salads and the Teriyaki Onion Chicken sandwich. There are other choices too that can be healthier and tasty. The protein options at Subway are generally either too small, too cold, or too salty. Although the greens are nice, I'll take a grilled chicken sandwich from just about any burger joint over what Subway offers. On the rare occasion I find myself needing to stop for food, I always choose Subway. It isn't the best, but it's far better than the alternative! Spinach, tomato, green peppers and pickles! I always choose Subway. I don't eat at fast food places because, like you, I get a stomach ache (literally). My 5 year old twin daughters choose Subway over McDonald's too. One chooses the cheese pizza, which is alot better than McDonanld's, right? !, and the other gets a kids meal (she likes the bag that comes with). And I love that you can customize based on what you have a taste for. WooHoo. I like the new chopped salads at Subway!Much better then the traditional salad. I do like Wendy's or Chick Fil A the best. I like the chili and salad's and I bring my own dressing. I use just balsamic vinegar. I like Wendy's where I get a small chili and a side salad and put the chili on the salad (I skip dressing of any kind). I absolutely love the salads at Subway - and those are made fresh too! I like Subway, but rarely go there. My kids are picky and the only sandwiches they will eat ate pb&j or cheeseburgers. The Subway here no longer offers pizza. My husband prefers Togo's because they offer spicier peppers. I tend to get smaller burgers and no fries at fast food places, so the calorie difference isn't so much. I usually avoid fast food salads because the low fat dressing is terrible and the other stuff has more calories than a burger. Annie--last year it was found that Subway had azodicarbonamide in their "fresh baked" bread. This is a material that is in yoga mats and other rubber products that isn't supposed to be for human consumption. Google Subway and yoga mat and you will get the story. While I do frequent Subway your readers should be aware that they do NOT offer whole wheat. In Canada their 9 grain bread has been died brown to falsely look whole wheat but is in fact white bread. Your diabetic readers will know this as the white bread causes their blood sugar to spike. They call it 9 grain to deceptively get away with this......shame. Annie--subway used to have an ingredient in their "fresh baked" bread called azodicarbonamide which is also in yoga mats and other rubber products. It isn't actually intended for human consumption. After the backlash, Subway removed it, but as I said before, it makes me wonder what else they are hiding in their food. For one, I dislike McDonald's with a passion. It mainly came about when I watched the documentary "Super-Size Me" many years ago. I didn't care for much of the food before that, though. My son, who is almost 2 and doesn't know any better, dislikes McDonald's as much as I do! He refuses to eat much of the menu items I have offered him (the few rare times we have had to go there), even the chicken nuggets). As for Subway, I enjoy eating there often (though I still prefer making my own food). Again, my son is a little picky (normal for a 2 year old), but he will eat enough on a Subway menu for me to take him there. Two things I would change about the Subway menu, however. 1.) make a kids menu that is more toddler friendly (this would be beneficial to many fast food and/or sit down restaurants) - little ones can't eat a sandwich! They eat the stuff that comes on a sandwich. 2.) offer parts of the sandwiches (e.g. the chicken breast) by itself. I have found that my son will eat a chicken breast that is cut up. Maybe Subway can lead the market in toddler-friendly menu options? Healthy ones, please! Some of us care what our kids eat! I haven`t had a burger at McDonald`s in 4 years now - since I started weight watchers. As my family still enjoys McDonald`s from time to time, we still go and I order a salad. I also get an upset tummy from McDonald`s. We call it the McGurgles!